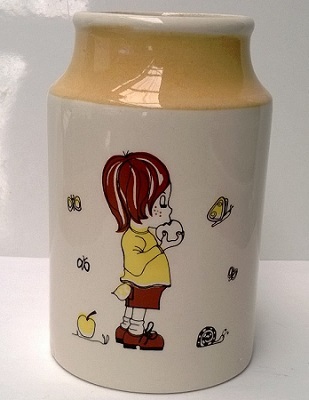 I cannot find the other Pen Pot topic but this is another from Jim's collection, and a matching shape in Dalwood? pattern. 11cmh x 7cmd no markings.. we assume this shape is CL too. I found this shape with a Youngset transfer on it yesterday. My goodness it so 'feels' like Crown lynn, but why would they have fired it on stilts? 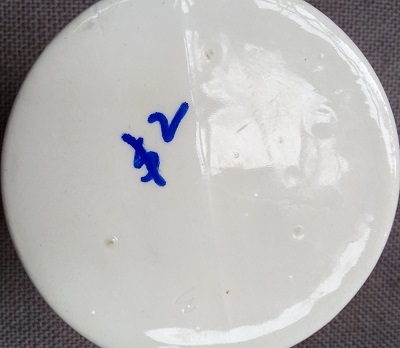 The base is flat and has no footring and is glazed all over, but the three stilt marks show up. I thought they fired only flatware on stilts? So confusing! 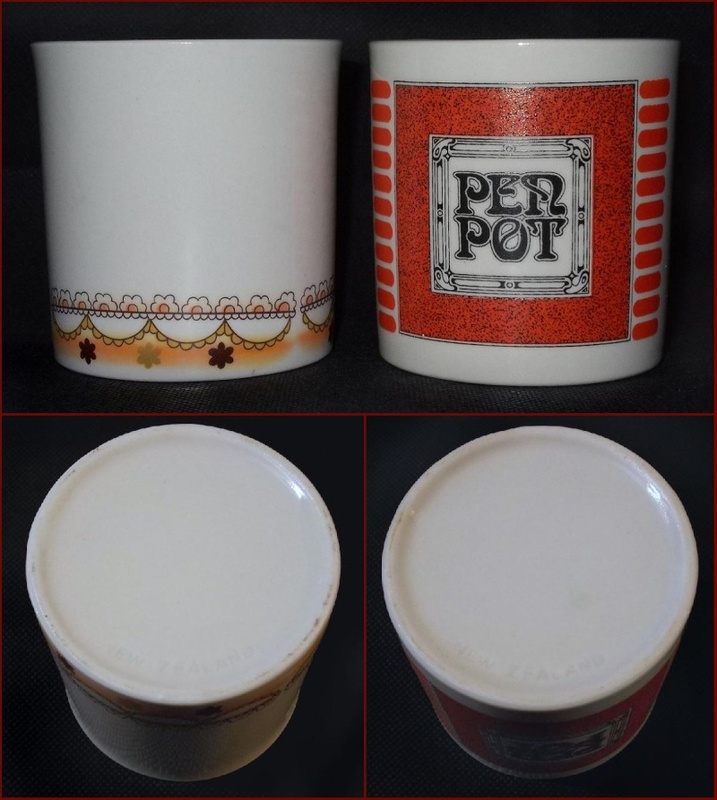 There are two Pen Pot descriptions in the Crown Lynn records which I will try and find later to see if we can shed any light on these little pots! Ball Point Pen Container d308 which would have been made around 1970 as the Expo 70 ware is on the same page. Ev, I think you also noted 1074 as a pen pot, but I've lost the location of that mention already. You have also noted Ballpoint Pen Container d308. None of the descriptions help us in any way! Kat that one with stripes isn't Dalwood, not sure what it is. mumof1's bathroom tumbler and Jim's pen pot? The impressed New Zealand mark is good for 1964. All the Classique items in the gallery have a distinctive shape which is different from the pots in this topic. 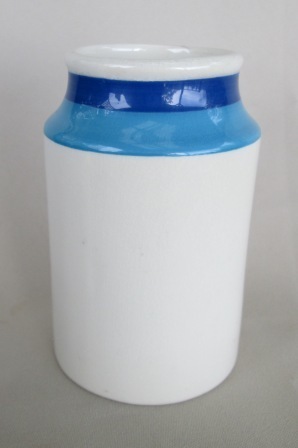 It may be that it isn't a pen pot shape, that the transfer was a leftover applied to the shape, and the not-Dalwood was the original item in this shape. 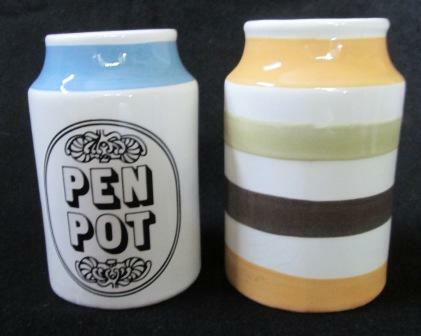 I have seen both of Jim's pots in this topic and they are quite tall and narrow for pens. The one in mumof1's topic seems more appropriate and the Bic one kind of minimal. Oh, re pattern not-Dalwood: Hacienda COLOURS but spaced apart. Spring Fair d4700, Homestyle d74600, Jasmine Flower d52500 and Duet d57600. These are all new shapes starting from around 1982. I've just got the pics in the gallery with Classique written under them to go by. 1358, 1360, 1362-3, 1364 and 1370. They have a consistent design theme. Concave base and concave upper portion meeting at a low waist. I would maybe expect a 1386 Classique to do so too. I don't know all those "d" numbers. Are you saying the others that you mention do not follow that theme? 1385 is a Tall Coffee Mug [Classique] though we don't have this yet. I do like the way that you are thinking and as the 1386 Tall Pen Pot is in this bracket of shapes it could well be the one! Val Monk's latest book says that Youngset is from the late 1970's ..... so that fits. From I can make out D numbers are purely decoration numbers - even the ones with no actual pattern have D numbers. however the d numbers don't NECESSARILY correlate with those so maybe there is a third, or even a fourth pen container. "Ball Point Pen Container d308 ... would have been made around 1970 as the Expo 70 ware is on the same page." The pattern on Ev's one is "from the late 70s"
"Pen Holder SB d079 [is] made in the late 1970's"
"1386 - Tall Pen Pot [Classique] first made around 1983"
I know Crown Lynn had stocks of transfers so a transfer can pre-date a shape or a shape can be decorated with a later transfer but I can't reconcile Ev's pot with the Classique shapes that I see in the gallery at this point. Yes Janice you are correct as even glazes have d numbers. yes Jeremy, we need some more definite info to come to hand and hopefully it will turn up. Hello, I have got a 1386 Crown Lynn New Zealand green stamp marked on the base pen pot from the Environmental Design Award. It looks like Ev's on the base just with a stamp. I also have to "find" a smaller but wider Pen Pot that I have stored in the garage. As usual, I'll get my husband to take a picture as soon as. 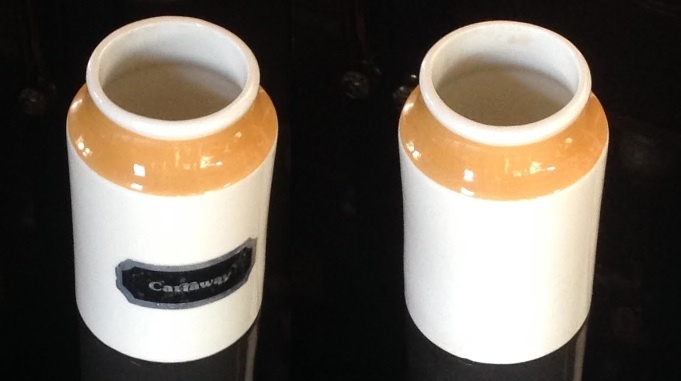 The white pot has a lip at the top rim. The pen pot hasn't. How fantastic to see the Crown Lynn Backstamp! Google turned up two hits for AHI Fibreglass Environmental Design Award, one is from 1981 and the other is from 1986, so I'm really leaning towards the 1386 shape for this pen pot! Just click it Jeremy, as I'm afraid to shorten this one! 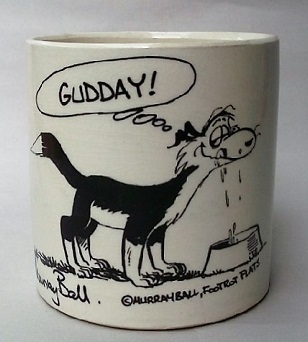 ARgggghhhhhhh I found this Pen Pot shape in the drawings!!!!!!!!!!!!!!!!!! It's a 1074. How embarrassing that it was here all of the time and I couldn't see it for looking! This is not a spice jar! 1074. A happy $1 purchase. Bit plain maybe. I found one in Blue, the bottom is glazed.. arent these strange bright colours for CL.? The blue maybe hand painted. Yes pretty sure its the same as all above. Yeah, I turned the picture round and compared to Ev's and it does look the same. Looks skinny or long sideways though. I checked again. It changes proportion when I copy it. Somehow it's compressing on my forum page. What a pity you've moved on from blue!